There are a lot of different ways to prepare pickled eggs. 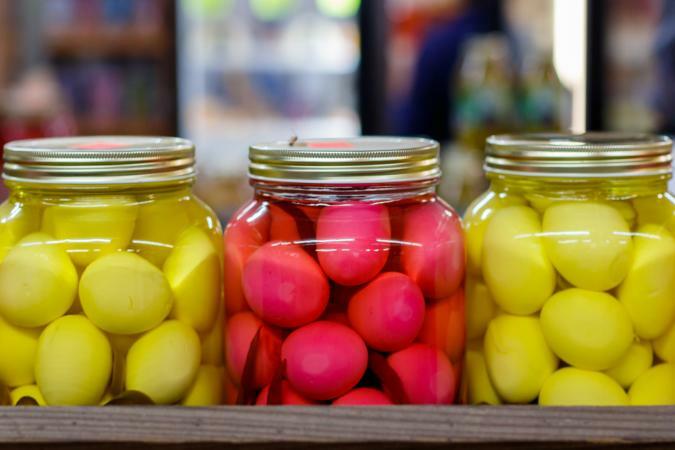 Whether you're looking for something hot and spicy, seeking a mild taste, or prefer a sweeter flavor, you'll find pickled eggs are more than just a classic bar snack. They rank among the favorite foods enjoyed during picnics, camping trips, tailgate parties and potluck dinners. Andrew Voss, Executive Sous Chef for Orlando's JW Marriott Grande Lakes resort shares his recipe for pickled eggs on Food Republic. He uses farm-fresh or organic eggs flavored with apple cider vinegar, juniper berries, chile flakes, salt, pepper, sugar, and a beet. Mama's Best pickled eggs recipe has earned five stars at Food.com where you'll find an easy step-by-step procedure for making this interesting take on this dish. This version is flavored with fresh gingerroot, allspice, garlic, white peppercorns, and vinegar. This recipe for fresh herb pickled eggs was created by Elaine Corn, award-winning author of 365 Ways to Cook Eggs, and it is a definite winner. It's seasoned with a variety of fresh herbs, including shallots, marjoram, thyme, and parsley, along with garlic, honey, vinegar and your choice of red chile flakes or peppercorns. This recipe for sweet pickled eggs and beets is among the favorites at Cooks.com. It's particularly great for home cooks who prefer simple recipes, as it requires only a few ingredients to flavor the eggs - beets, beet juice, brown sugar, cider vinegar, and sliced onion. They offer an option for a printer-friendly version if you want to add a hard copy to your collection of recipes. Adapted from The Joy of Pickling, the recipe on Modern Beet for hot and spicy pickled eggs is a great one to try if you're looking for a protein-packed snack that is super-spicy. The recipe calls for two fresh chile peppers (though you can substitute jalapeño or serrano peppers) and black pepper, ginger, mustard seeds, garlic, cider vinegar, and salt. If you're looking for an even spicier version of pickled eggs, try this interesting recipe for sriracha pickled eggs. This recipe is highly-rated on AllRecipes and features only four ingredients beyond eggs and water - sriracha, vinegar, salt, and a sliced onion. As the recipe creator points out, "These make a quick, tasty snack any time of day or for those following a low-carb diet." If you enjoy eggs, love bread and butter pickles, and crave ridiculously easy recipes, you're sure to take delight in Rachael Ray's fun and frugal recipe for bread-and-butter pickled eggs. The next time you finish a jar of bread and butter pickles, don't get rid of the juice or the jar. Instead, add a few peeled boiled eggs to it, along with a couple bay leaves and a few sprigs of dill. Refrigerate it overnight and you'll have a new snack to enjoy! This recipe from Food Network Kitchen combines pickled eggs with carrots for a bit of a unique combination. To make their golden pickled eggs with carrots recipe, you'll need coriander seeds, yellow mustard seeds, turmeric, thinly sliced carrots and onions, crushed red pepper flakes, a bay leaf, sugar, and vinegar. This version is particularly good for people seeking the health benefits of turmeric. If you're looking for a fancy pickled egg recipe, try this awesome option from celebrity chef Bobby Flay. His saffron pickled eggs have (as you would expect) saffron treads, along with caraway and fennel seeds, white wine vinegar, garlic, peppercorns, salt and cane sugar. Love the flavor of jalapeño peppers paired with eggs? Apparently a lot of people do, as the recipe for jalapeño dill pickled eggs on the Putting Up With Erin canning blog is the site's "most popular blog post of all time." This recipe uses fresh jalapeño peppers cut into slices, fresh dill, red pepper flakes, sliced cloves of garlic, sugar, salt, and vinegar. It packs a punch but tastes great!